This Friday at 9pm Eastern, discover a new area in Bloodriven Village! A NEW AREA of underground tunnels has been exposed! Bloodriven Village is a town always suspected to be a haven for those with roguish ways. And now it seems that these scoundrels of days gone by may have been caught in the quake, their troves of treasure lost beneath the streets! Come to the Sunken Tomb beneath the village and help the archaeologist dig up lost treasure! Who knows what those mischief makers had hidden in their lairs! Spoils from a raid? A cache of weapons? Is it possible that some Artifact pieces didn’t end up in the Sewers, after all? Find gems unique to the Bloodriven Archaeological Dig! Unique treasure can be found throughout the tunnels! The Archaeologist suspects Moonshards and Pendants may be discovered beneath the tunnel floors. What else might lie there? 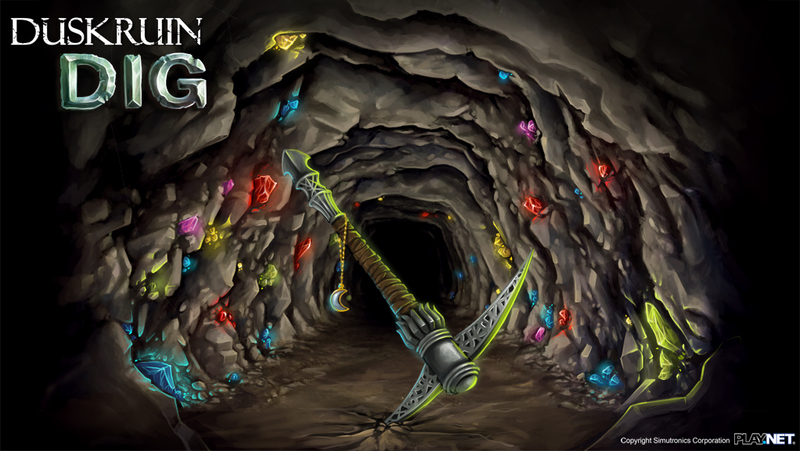 Ores found in the dirt of the tunnels are said to be rich in metals not found in the Arena. Reports say these ores are being found in newly completed pendants! Take the wagons, available in most towns, to the outskirts of Bloodriven Village. Head through the gates to the Underground Temple, from where you can access the tunnels. While the Arena and Sewers are currently closed for inspection by the Bloodriven Health Department, the village shops will be open for your perusal and shopping pleasure. Shops accept Bloodscrip as their only currency, and inventory will not be updated during the Duskruin Dig. 3. What if I still don't want a pendant? Talk to the Archaeologist in the Underground Temple. He has some extra Bloodscrip he will trade you for pendants and Moonshards. 4. Wait! I don't own any digging tools! How do I get the treasure? Easy! Head to the SimuCoin Store and purchase a pickaxe. You will find single and multi-use options to meet your digging needs! The Archaeologist eagerly waits your arrival! The Duskruin Dig will be open from 9pm Eastern this Friday, June 17 through June 26!